This blog was contributed by Ajit D’Brass, CFD Intern at Flow Science. June was slowly creeping towards triple-digit heat, the AC in my car needed a recharge, and I had just graduated from college. I never thought I’d leave the great State of Texas for its enchanting next-door neighbor, New Mexico. But ready for change, I jumped at the opportunity to test my mettle as an engineering intern at Flow Science. On my way to Santa Fe, my mind wandered to the possibilities of the future. My knowledge of Flow Science was limited to my interviews and a terse web search. A connection to LANL, very suave simulations, and a software company with a highly-educated crew; high science in the high desert. 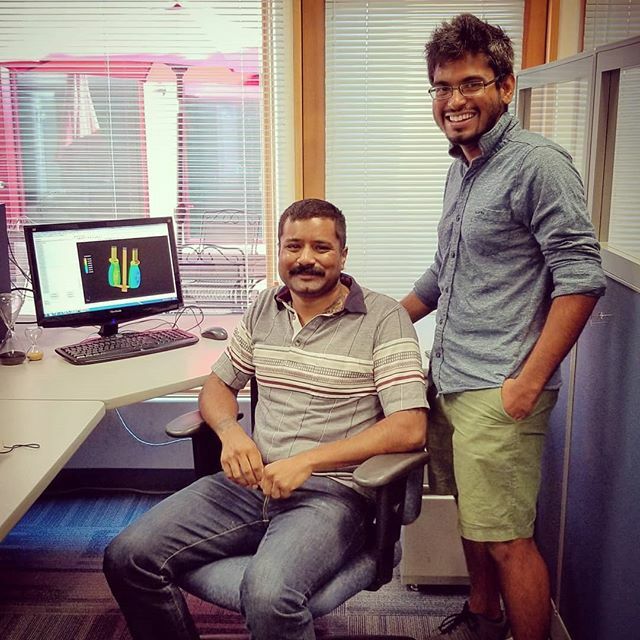 Ajit and his mentor, Karthik Ramaswamy, a CFD Engineer at Flow Science. On my first day I met with John Wendelbo (Director of Sales). He caught me up on the various teams in the company and introduced me to the staff. Everyone extended an inviting greeting and the office felt casual. The staff is a diverse group of people who are working on complex real-world CFD problems. As I was settling into my new workstation, I heard a small cheer from the Free Surface Café. To my surprise, lunch breaks were accompanied by a fervent viewing of the 2018 World Cup. WHAT!? CFD and Soccer. I immediately felt that I had made the right decision. My first weeks at Flow Science were spent improving my CAD skills and learning how to set up models using FLOW-3D CAST. It was an immediate and challenging check of my knowledge of fluid dynamics and practical heat transfer topics. To aid my journey, I was encouraged to reach out to my coworkers. During this preliminary stage of my internship (aka confusion, disillusion, inferiority, and frustration) having the support, sales, and development teams at my disposal proved an immense benefit. I’m truly grateful for their approachable nature and clear advice. Wrapping up the month, Amir Isfahani (CEO) hosted an open house for the local tech community and gave a live Q&A with the Mayor of Santa Fe, Alan Webber. The whole vibe of the evening was positive. There was also a visible sense of pride in the innovation throughout the company’s history. I joined the weekly soccer game that the staff plays on Tuesdays. Apart from being good exercise, it was a great way to get to know everyone outside of the office. While the games are only semi-competitive, there are top-level disagreements over probable goals. A good engineer can make a good argument! Ajit (left) arrives at Lake Catherine with his fellow trekkers, Karthik (center) and Paree (right). Meanwhile, my modeling skills were getting sharp. John gave me the go-ahead to start creating my own projects based on the objectives of the internship program. My focus was designing full riser and gating systems for gravity pour castings. I also started to review research papers on alloy solidification. Simulation of casting takes into account many different physics models and getting these in harmony is amazing work. It started raining every evening here in Santa Fe. The nights grew cool and brisk. I accompanied another hiking group from the office to Wheeler Peak (the highest point in New Mexico, at 13,159’). It proved to be another physical and mentally challenging trek, once again reminding me of how hard work and dedication pays off. Plus, the drive from Santa Fe to Taos is stunning! I was now feeling confident as a FLOW-3D CAST user. I’ve had some breakthroughs on understanding how simulations are derived, how users can connect with this program, and how to efficiently set up simulations for objective-based analysis. The capstone deliverable of the internship program was a presentation in front of the company. I’ve worked with tight deadlines before, but never in a CFD environment. What I found was that communicating one’s understanding is as important as one’s comprehension. The sales team here communicates with clarity and accuracy, and I hope to get the knack for it. The last two weeks I spent time building meaningful simulations to go with a clear PowerPoint presentation. I received a ton of feedback in the form of “dry-runs” and critiques. It’s nice to know that this is something that requires practice and repetition. While there is a slight improvised sensibility, knowing the cues that create a meaningful narrative flow is imperative. It’s been a great experience here, and I have nothing but gratitude for the people of Flow Science. They have opened their hearts and minds to me. The knowledge I’ve acquired will inform both my professional and personal life to come. 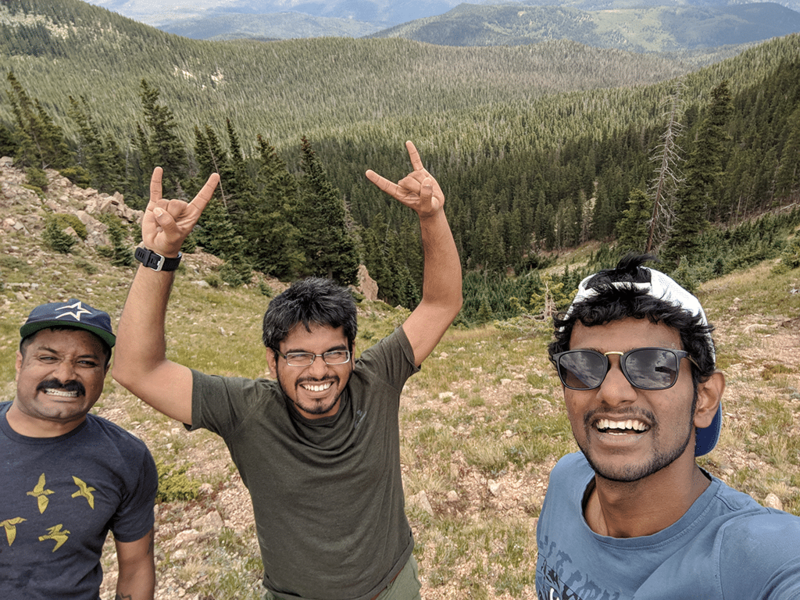 Editor’s note: After taking a well-deserved break to go “wrangle some details in Texas,” Ajit will join the Flow Science Sales team as a full-time CFD Engineer in October.